"He is the Potter; We are the Clay." - "He is the Potter. We are the Clay." 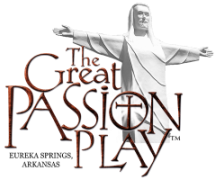 Parables of the Potter is performed at 7:30 PM (6:30 PM after Labor Day) before each Great Passion Play performance. Each evening before The Great Passion Play performance, the Potter stands at his wheel molding clay into form. As he works the clay, The Potter teaches from inspirational passages of the scriptures, including Jeremiah 18. A ministry of the Word of God through the ancient craft of pottery, Parables of the Potter is one of the most appreciated and meaningful teachings you will ever enjoy. - The potter's clay as compared to "the human flesh"
- The hand of the potter as the "leading of the Holy Spirit"
- The forming of the vessel as the "shaping of the Christian mind"
- The firing of the formed, but soft, pot as "life's fiery trials"
- The reflected light of the fired vessel as "the work of the Holy Spirit in the life of the responsive and obedient Christian"